It’s Wednesday, and Albert’s adventure with the Blobite continues. 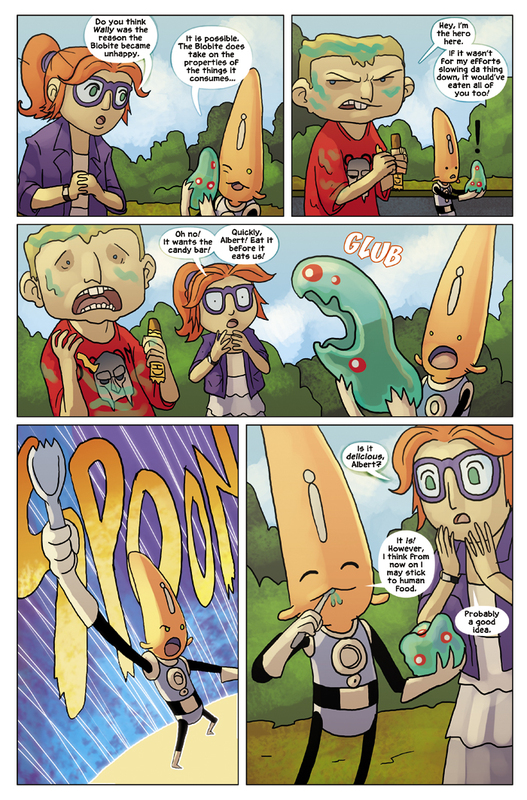 The kids appear to have defeated the Blobite, however it’s still hungry .I’m 1) surprised that Wally keeps a candy bar in his pocket, and 2) disgusted that he would even think of eating it after being covered in alien lunch slime. But who knows – perhaps the flavor properties of the Blobite would make the candy bar taste better? But that’s not important. What is important is the moral of the story. And that is about the importance of diet and exercise in your everyday life. And when I say “diet” I don’t mean going on a diet, but watching what you eat and ensuring you limit the junk food and focus on the healthy stuff. Growing up, we were a very “meat and potatoes” kind of family. We had a sampling from each of the basic food groups. This can ensure your meals are nutritious, colorful, flavorful, healthy, and yet enjoyable. My mother always made sure to put some variety on our plates, make us try new things (much to the dismay of my younger brother, who was a bit of a picky eater). And ultimately, it helped us to diversify our palates and enjoy different kinds of foods. And your taste buds change over time, so trying foods again you didn’t like years ago may behoove you. I didn’t like tomatoes growing up, but now I love them. The second part of the equation is exercise. We always balanced food with having fun outdoors and doing physical activities that helped us stay strong. Running, biking, swimming, exploring the woods nearby, and running around on the playground were all things I enjoyed doing growing up – and honestly, I still enjoy them today. In the winter time, I was about building snow forts, sledding, skiing, and generally enjoying the seasons and all the unique things they bring. I hope you’ve enjoyed this adventure with Albert and his alien lunch – but we’re not done yet! There’s another 3 pages left in this adventure. See you Friday for the next update!